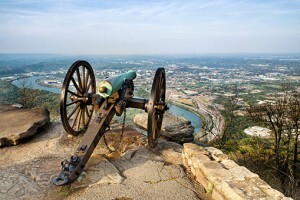 Chattanooga claims it has the fastest public internet service in the western hemisphere in its community-owned fiber network, but you might want to slow things down and enjoy the scenery in this progressive, outdoor city nestled in southeast Tennessee. The Scenic City, as it’s called, is ringed by mountains and ridges and has gained a reputation as an outdoor lover’s paradise. Welcome to Chattanooga! Your day one itinerary will ease you into this southern city. A full schedule awaits, and you’ll need sustenance, so fill up on a classic southern comfort food breakfast at Maple Street Biscuits before cruising down the river on a super cool, high tech jet boat. The Tennessee Aquarium’s River Gorge Explorer flies down the Tennessee River Gorge at speeds of up to 50 miles per hour, but it’s not all thrills as your guide will point out wildlife and points of interest as you cruise along in air conditioned comfort. Regain your land lubber status and have lunch at Champy’s Famous Fried Chicken for deep fried goodness. 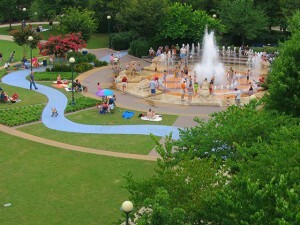 Walk it off and orient yourself in the city by taking a stroll on the Tennessee Riverpark, a linear park that stretches for 8 miles. Walkers and bicycle riders alike delight in the lighted concrete path with stunning river views. The nearby historic Northshore district has galleries and shopping, and the Brewhaus provides a balcony with views where you can get a beer and a pretzel. For a relaxing dinner, take in views of the river in a renovated Colonial Revival mansion at the Back Inn Café, located in the charming Bluff View Arts District. Start off with a down home breakfast at Bluegrass Grill. Munch on homemade grits, special French toast, biscuits, and omelets before moving on to a more active day. Head up to Lookout Mountain and park at the historic Cravens House, the only remaining Civil War era structure on the mountain. Pick from multiple trails that range in difficulty, and enjoy stunning vistas extending into North Carolina and Georgia. Get nourishment at Sluggo’s Vegetarian Café as you head downtown. Sluggo’s features all the vegetarian favorites: a hummus plate, homemade chili, black bean burritos, and a variety of bowls. After a light lunch, test your nerve at High Point Climbing and Fitness, which has one of the most extensive network of climbing walls in any gym in the country. The indoor and outdoor facility is truly impressive, and caters to beginners and advanced climbers alike. Catch your breath before going to dinner at the Terminal Brewhouse. Get a steak, salmon dish, burger, ribs and more while downing a delicious craft beer in a relaxed atmosphere. End your night at Clyde’s on Main, a dive bar that has a dance floor, live music, and more delicious food for your late night cravings. Rise and shine, travelers! Time for another awesome breakfast, this time at Milk and Honey, which specializes in homemade, simple food and pastries which you can take to go. 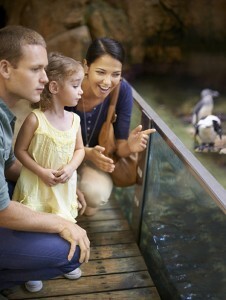 Next, round out your getaway in Chattanooga by viewing the impressive and colorful displays at the Tennessee Aquarium. See penguins, giant sturgeon, and a butterfly garden, and catch the 11 a.m. tours through the River Journey Building, where you can feed the sea otters. Hop on Chattanooga Pints and Pedals, a two-hour tour of the downtown’s pubs and eateries. While away the afternoon at DeBarge, an urban winery housed in a brick building from 1910 that has oenophiles raving about the Chardonooga, a locally sourced wine made from a blend of Chardonelle and Cayuga grapes. End your stay with a foodie’s delight dinner at Alleia, a restaurant concept by James Beard nominee Daniel Lindley. The Tuscany-inspired menu will leave you satisfied with small plates and entrees alike featuring local sources.